Putting 420 big blue dots on a map of New York really crystallizes what had been abstract so far: Bike-share is going to blanket the core of the city. If you live, work, study, or socialize in Manhattan below 60th Street or northwest Brooklyn, there’s going to be a station within a few blocks of your apartment, your office, your subway stop, your favorite cafe or that out-of-the-way gallery you’ve been meaning to check out. Within the service area — which will include ten stations in Long Island City from the outset — there’s pretty much a consistent grid of stations, meaning ready access from just about anywhere. The station density is higher in some places (check out Washington Square) and lower in others (Midtown is a bit sparser than downtown), but essentially there’s nowhere without good coverage. The one major exception is insular south Williamsburg, where local Hasidic leaders have fought bike infrastructure and complained about the mere presence of cyclists. There, a square of more than half a mile in each direction is entirely without a station. Other gaps exist — there aren’t any stations on the narrow streets of Little Italy, for example — but outside of south Williamsburg’s Satmar neighborhood none seems large enough to really impede the use of the system. What’s interesting here is that the map looks almost identical to the service area recommended by a 2009 Department of City Planning study. The Phase 1 service area, that is. DCP also recommended that bike-share expand two more times. Phase 2, which would cover all of Manhattan, most of the South Bronx and western Queens and more of Brooklyn, would triple the size of the system, from 10,000 bikes to 30,000. “These phases should be introduced as soon as possible,” recommended DCP. That kind of bike-share expansion is a project for another mayor, of course. But just remember: all those blue dots on today’s map might be just the beginning. The Department of City Planning recommended that Phase 2 of bike-share cover large swaths of every borough but Staten Island, and all of Manhattan. Good catch about Little Italy. I don’t think the streets are any narrower than those in the Lower East Side, and the LES has plenty of stations. Maybe once the construction is finished on Grand Street, they’ll put a station there near Mott St, which would nicely fill a big gap and serve a major destination. Also, the City has posted the more detailed draft maps shown to CBs on it’s Facebook page. There are some slight differences between these maps, and the one on the DOT website. For example, there is a station at Clinton & Myrtle in Brooklyn on the detailed map, but not on the larger DOT map. Anyone know why that is? It’s confusing not to see Red Hook included even in Phase 2; that’s an area incredibly poorly served by transit with both shoppers and residents as potential users. Docks at Fairway and Ikea seem like such no-brainers that I really don’t understand why there are none there. J: These are draft maps according to the Citibike web site. I saw that and assumed there are going to be some pre-launch changes. Agree w JoshNY about Red Hook. Surprised and disappointed to see nothing in the 90s (at least not yet). Doubly surprised and disappointed that Phase 1 does not cover the entire Manhattan Greenway, since I would need a car-free environment with a starting point in my neighborhood to even consider biking. I thank the developers for their hard work and hope for better days. But I’m putting off that helmet purchase. One location in LIC is going to cause a problem by being on the sidewalk instead of on the street in a parking lane. 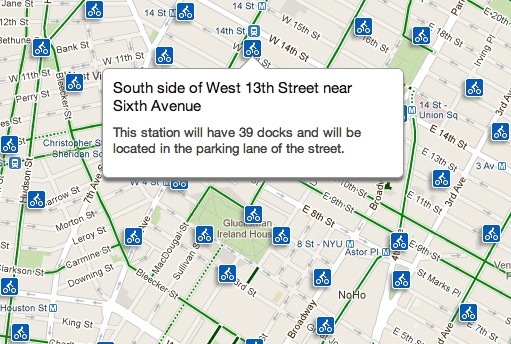 There is to be a station with 31 docks on the south side of Queens Plaza North at Crescent Street on the sidewalk. The sidewalk on the south side of Queens Plaza North is very narrow. People will not be able to use the sidewalk with the bikes there. People will instead walk on the bikeway which is already happening and which is already a problem. The bikeway coming off of Queensboro bridge in Queens is narrow. It’s cute and it meets today’s bike demand, but it was shortsighted of the DOT to build such a narrow two-way bikeway. They had the space to make something much wider that would accomodate future bike volumes, but instead it was built narrow which will be insufficient onces bike ridership goes up. To compound this problem by forcing people to walk on the bikeway by taking away their sidewalk for a station is not good. This station could and should be in the parking lane on the north side of Queens Plaza North at Crescent Street instead. Interesting that spring 2013 will expand into Sunnyside and not Astoria. Red Hook is actually included in phase 2, it just looks like nothing west of Van Brunt and perhaps nothing south of Coffey will be included, which seems stupid since Fariway and Ikea are both on the southern shore of the hook. They should really cover through Conover and Beard streets. The expansion next Spring should be bigger than just finishing the 3,000 bikes that could not be implemented in the initial roll-out due to the delay in finding a sponsor. 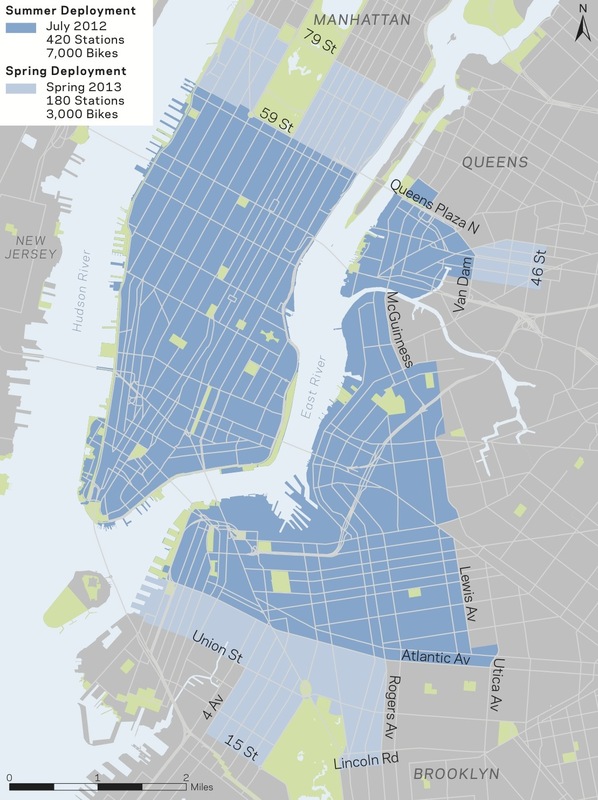 I think Alta should put another 7,000 bikes out next Spring – and include Red Hook and Carroll Gardens in Brooklyn and include all of Manhattan up to 125th Street at least. The Carroll Gardens exclusion is so strange. I wonder who decided to make the boundaries 4th Ave and Union St instead of, say, Hamilton Ave (or including Red Hook too). Alta couldn’t even deliver all 61 promised stations in Boston last year and took well over two months to place all 61 stations this year. What makes anyone here think that NYC is going to get all of these stations in a timely fashion? Perhaps they learned from experience and have more subcontractors on board? As big as this is for NYC, given the media prominence of NYC this is even bigger for Alta and any of its suppliers. Prove the demand and the ability to operate the system and the orders will keep rolling in. sorry, but this to me needs to be even BIGGER. my remote part of queens needs this. We thought that Alta would have learned from operating D.C., but were unpleasantly surprised. Larry Littlefield is right: East midtown has too few stations. That is a high-density area for jobs. Many commuters arrive at Penn Station and Port Authority and need a way to get to their workplaces in East midtown; they will be able to get a bike at Penn Station or Port Authority, but there is no place to lock up the bike once they arrive at their work in East midtown, which defeats the purpose of bikeshare which must make it convenient for users. From East 53rd down to 36th Street, from Madison over to 2nd Avenue, is served too scarcely with stations. There should be a station on each Avenue every four blocks, but instead there are hardly any stations in that whole area. I can’t wait for phase 2 when it is 30,000 bikes and covers the much larger geographic area of NYC. I wish the DOT could do phase 2 as soon as possible! @88b32fb69e499718d95067da9d3d7b03:disqus EDC built the greenway at Queens Plaza, not DOT. Thank you, Guest, for the correction. Then EDC, not DOT, was the entity who was shortsighted about the width of the greenway at Queensboro Plaza (making it only wide enough for current demand rather than wide enough to handle future projected demand). Perhaps it will work like auto trip generation in the highway building era. New highways induced more people to travel by car which congested local streets and increased the demand for more highways. I don’t quite get the hesitancy to expand South in Brooklyn, while going so far East into Bed-Stuy and Bushwick. Union St. is a weird cutoff point in the middle of South Brooklyn – they include Park Slope but sort of cut Carroll Gardens and Gowanus in half, while excluding Red Hook? What’s the logic there? These places are all complete slam dunks for this program, as are Sunset Park, Windsor Terrace, etc., I would think. Phase 2 seems like a weak follow-up to Phase 1. I have little doubt it will increase the demand for more bike share-it hasn’t even started yet and people are already complaining that it doesn’t go far enough-but I hope it also increases the demand/political will for high quality bicycle facilities. Ridiculous that the city caved and didn’t put any stations in South Williamsburg — is this Iran or NYC? west of Van Brunt and perhaps nothing south of Coffey will be included” is the bottom map (with the brown coloring to designate the coverage area), but according to caption that map is the Department of City Planning’s recommendations, while the actual Phase 2 rollout will be as shown in the upper map (with the blue coloring to designate the coverage area), ending at Union Street and 4th Avenue. I hope I’m wrong. Along those lines I’m hoping increased bicycle usage finally induces the city to build a network of bike “highways” to complement the growing at grade “local” bicycle network. I can’t think of one single thing which would massively increase bicycle usage, and greatly speed up bicycle travel times, especially along congested corridors with lots of traffic signals. We have lots of existing grade-separated infrastructure, at least in the outer boroughs, which could be leveraged for this. You could hang the bikeways under els, along railroad viaducts, along or under expressways. While Red Hook and Gowanus would be welcome additions given their lack of transit and existing high bike use, but it comes down to population density. Density has to reach a certain threshold to justify the investment – they don’t make the cut, sorry. Linda: Carroll Gardens is plenty dense, and was excluded. And there’s tons of commercial operations in Gowanus, including a forthcoming Whole Foods, that are tremendous trip generators to surrounding areas. No. Phase 2 will only get it to 10,000 bikes, not 30,000. There’s some semantic confusion going on. We’re counting the spring 2013 addition of 180 more stations as the completion of “Phase 1,” which will include 600 stations and 10,000 bikes. The 2009 DCP study we referenced recommends a “Phase 2” that is much larger — 30,000 bikes — but it’s just a planning document. While it seems reasonable to assume that if Phase 1 is successful and popular, the city would seek to expand the system, Phase 2 is hypothetical at this point. It’s not in the pipeline right now, but the map helps you see where bike-share could expand next, given the political will. Most diagonal moves across the Manhattan grid are slow or expensive. Bike share will unite the east and west sides like nothing else can. For the cost of 5 taxi rides you can have unlimited use of the bike share system all year. There won’t be enough space for the bike stations to meet demand within 5 years sez me.